In clinical practice, the level of arterial oxygenation can be measured either directly by blood gas sampling to measure partial pressure (PaO2) and percentage saturation (SaO2) or indirectly by pulse oximetry (SpO2). This review addresses the strengths and weaknesses of each of these tests and gives advice on their clinical use. 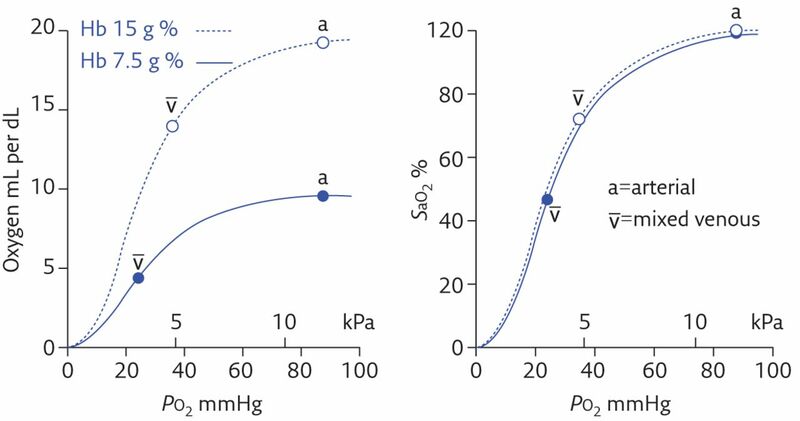 The haemoglobin–oxygen dissociation curve describing the relationship between oxygen partial pressure and saturation can be modelled mathematically and routinely obtained clinical data support the accuracy of a historical equation used to describe this relationship. Educational Aims To understand how oxygen is delivered to the tissues. To understand the relationships between oxygen saturation, partial pressure, content and tissue delivery. The clinical relevance of the haemoglobin–oxygen dissociation curve will be reviewed and we will show how a mathematical model of the curve, derived in the 1960s from limited laboratory data, accurately describes the relationship between oxygen saturation and partial pressure in a large number of routinely obtained clinical samples. To understand the role of pulse oximetry in clinical practice. To understand the differences between arterial, capillary and venous blood gas samples and the role of their measurement in clinical practice. The delivery of oxygen by arterial blood to the tissues of the body has a number of critical determinants including blood oxygen concentration (content), saturation (SO2) and partial pressure, haemoglobin concentration and cardiac output, including its distribution. The haemoglobin–oxygen dissociation curve, a graphical representation of the relationship between oxygen satur­ation and oxygen partial pressure helps us to understand some of the principles underpinning this process. Historically this curve was derived from very limited data based on blood samples from small numbers of healthy subjects which were manipulated in vitro and ultimately determined by equations such as those described by Severinghaus in 1979. 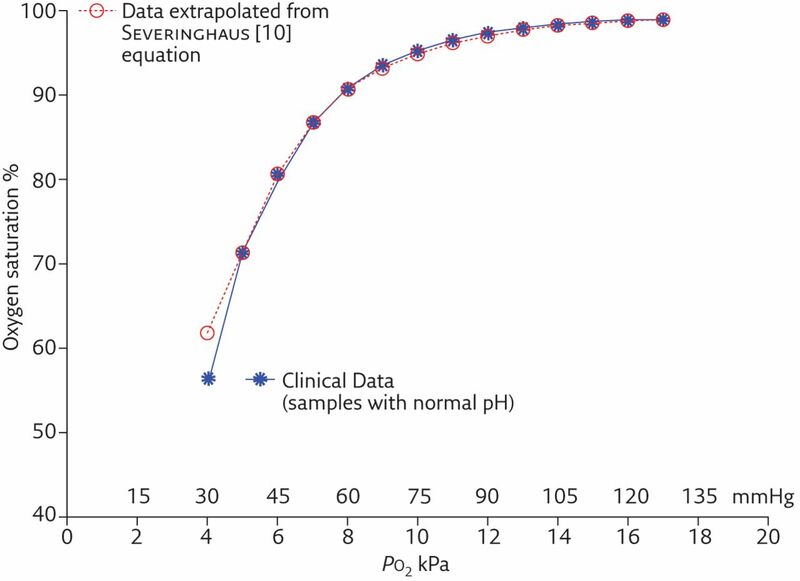 In a study of 3524 clinical specimens, we found that this equation estimated the SO2 in blood from patients with normal pH and SO2 >70% with remarkable accuracy and, to our knowledge, this is the first large-scale validation of this equation using clinical samples. Oxygen saturation by pulse oximetry (SpO2) is nowadays the standard clinical method for assessing arterial oxygen saturation, providing a convenient, pain-free means of continuously assessing oxygenation, provided the interpreting clinician is aware of important limitations. The use of pulse oximetry reduces the need for arterial blood gas analysis (SaO2) as many patients who are not at risk of hypercapnic respiratory failure or metabolic acidosis and have acceptable SpO2 do not necessarily require blood gas analysis. While arterial sampling remains the gold-standard method of assessing ventilation and oxygenation, in those patients in whom blood gas analysis is indicated, arterialised capillary samples also have a valuable role in patient care. The clinical role of venous blood gases however remains less well defined. The main function of the circulating blood is to deliver oxygen and other nutrients to the tissues and to remove the products of metabolism including carbon dioxide. Oxygen delivery is dependent on oxygen availability, the ability of arterial blood to transport oxygen and tissue perfusion . The oxygen concentration (usually termed “oxygen content”) of systemic arterial blood depends on several factors, including the partial pressure of inspired oxygen, the adequacy of ventilation and gas exchange, the concentration of haemoglobin and the affinity of the haemo­globin molecule for oxygen. Of the oxygen transported by the blood, a very small proportion is dissolved in simple solution, with the great majority chemically bound to the haemoglobin molecule in red blood cells, a process which is reversible. The content (or concentration) of oxygen in arterial blood (CaO2) is expressed in mL of oxygen per 100 mL or per L of blood, while the arterial oxygen saturation (SaO2) is expressed as a percentage which represents the overall percentage of binding sites on haemoglobin which are occupied by oxygen. In healthy individuals breathing room air at sea level, SaO2 is between 96% and 98%.The maximum volume of oxygen which the blood can carry when fully saturated is termed the oxygen carrying capacity, which, with a normal haemoglobin concentration, is approximately 20 mL oxygen per 100 mL blood. Oxygen delivery to the tissues each minute is the product of arterial oxygen content and cardiac output. Hence oxygen delivery can be compromised as much by a low haemoglobin concentration or low cardiac output as by a fall in the SaO2. Following circulation through the tissues, the average oxygen saturation in the venous blood returning to the right side of the heart (mixed venous blood) is typically about 75% in healthy individuals at rest, a figure which implies a considerable “reserve” in the oxygen delivery system. The level of oxygenation of peripheral venous blood, however, will vary depending on local metabolism and oxygen consumption. The reserve in the system is called upon, for example, during exercise when the contracting muscles extract more oxygen such that the saturation of venous blood falls. Relatively greater extraction of oxygen by vital organs also occurs if cardiac output is impaired resulting again in reduction in mixed venous saturation. The complex regulatory mechanisms involved are reviewed in detail in the physiology section of the British Thoracic Society emergency oxygen guideline . 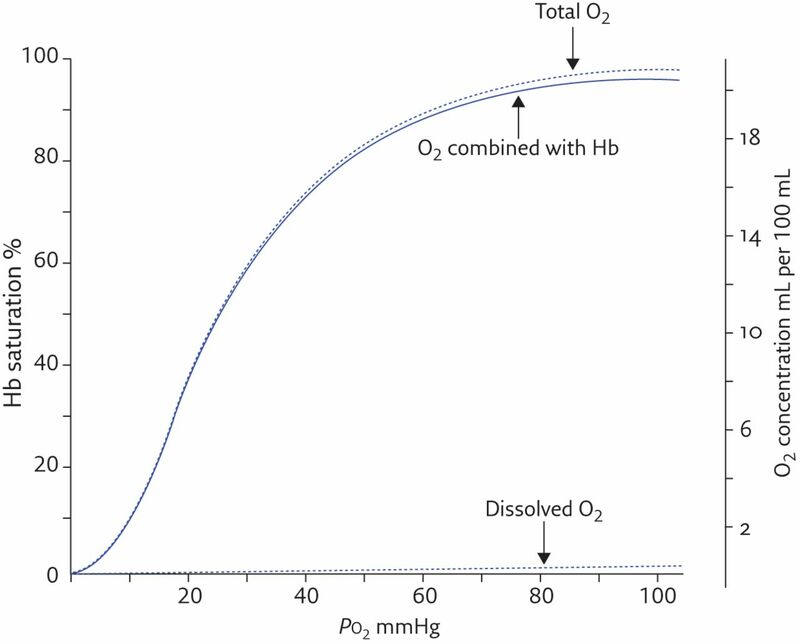 The relationship in blood between oxygen saturation (SO2) and partial pressure (PO2) is described graphically by the oxygen–haemoglobin dissociation curve (ODC) (figure 1). As defined above, SO2 represents the overall percentage of haemoglobin binding sites which are occupied by oxygen. Each haemoglobin molecule can bind reversibly up to four oxygen molecules; in addition, haemoglobin has the property that the binding of one oxygen molecule facilitates the binding of subsequent oxygen molecules. Consequently, the affinity of each haemoglobin molecule for oxygen increases until all four of its binding sites are occupied. This binding of oxygen to the haemoglobin molecule accounts for the increasing slope of the ODC at low levels of oxygenation. At higher oxygenation, the curve flattens off as all the haemoglobin molecules approach full saturation, resulting in the characteristic sigmoid (s-shaped) appearance (figure 1). ODCs in a theoretical healthy subject with a normal blood haemoglobin (Hb) concentration of 15 g ⋅ dL−1. The y-axis can be plotted as either % saturation or oxygen content (concentration); with the latter showing the very small amount of oxygen dissolved in solution. Provided that haemoglobin and circulatory function are normal, a patient’s arterial oxygen saturation (measured either directly on arterial blood, (SaO2), or estimated by pulse oximetry, (SpO2)) gives information about the amount of oxygen that is available to the metabolising tissues. The partial pressure of oxygen (also known as the oxygen tension) is a concept which often causes confusion. In a mixture of gases, the total pressure is the sum of the contributions of each constituent, with the partial pressure of each individual gas representing the pressure which that gas would exert if it alone occupied the volume. In a liquid (such as blood), the partial pressure of a gas is equivalent to the partial pressure which would prevail in a gas phase in equilibrium with the liquid at the same temperature. With a ­mixture of gases in either the gas or liquid phase, the rate of diffusion of an individual gas is determined by the relevant gradient of its partial pressure, rather than by its concentration. While in a gas mixture, the partial pressure and concentration of each gas are directly proportional, with oxygen in blood the relationship is more complex because of its chemical combination with haemoglobin. This allows blood to carry an enormously greater concentration (content) of oxygen than, for example, water (or blood plasma). Measurement of PO2, therefore, does not give direct information about the amount of oxygen carried by blood. The use of arterial PO2 (PaO2) as a valid index of arterial oxygenation is justified because measurements are interpreted with implicit assumptions about the ODC. In addition, PaO2 is important because most oxygen-dependent physiological systems, such as oxygen sensing, respond to changes in PO2 in their microenvironment. In most situations, in both healthy subjects and those with pathology, oxygen saturation (or content) and tension move in the same direction, albeit in a very nonlinear fashion. There are, however, occasions where the different indices of oxygenation deviate because of alterations in the dissociation curve. In general, a rise in PaO2 (produced, for example, by an increase in the rate or depth of ventilation or by breathing supplemental oxygen) is accompanied by a rise in the arterial oxygen saturation. However, because of the shape of the dissociation curve (figure 1), the proportional increases are very different. Since the dissociation curve is relatively flat when the oxygen saturation is >90%, increases in PaO2 have relatively little impact on saturation or content in this range. Clearly, as SaO2 approaches 100% (equivalent to a PaO2 greater than about 17 kPa or 128 mmHg), there can be no further increase in saturation however high the PaO2 rises. However, breathing increasingly higher oxygen concentrations continues to increase the PaO2 and there will also be a small, progressive rise in oxygen content of the blood, due to the small, though increasing, amount dissolved (as, indeed, would also happen with water exposed to a high PO2). Paradoxically, however, a very high PaO2 may reduce oxygen delivery to the tissues due to other physiological effects such as vasoconstriction or reduction in cardiac output . By contrast, when PO2 falls below 8 kPa (60 mmHg) there is a steep decline in oxygen saturation (fig. 1). This situation has been described as a "slippery slope" as small reductions in PaO2 are accompanied by disproportionately large reductions in oxygen saturation and content and therefore in oxygen delivery. To some extent the reduced oxygen delivery is countered by the greater ease with which oxygen can be “offloaded” to the metabolising tissues. Equally, however, this portion of the dissociation curve could be regarded as a “life-saving escalator” as a small increase in PaO2 in a severely hypoxaemic individual is likely to result in a marked improvement in oxygen saturation, content and supply. This phenomenon underlies the use of only small increments of inspired oxygen (e.g. using a Venturi mask to deliver 24% or 28% oxygen compared with 21% in room air) in the treatment of patients with hypercapnic respiratory failure, in whom higher oxygen concentrations are likely to result in worsening hypercapnia [2, 3]. For most adult patients the optimal target oxygen saturation is 94–98%; an important exception is those at risk of CO2 retention, in whom a lower target saturation is appropriate, because a greater increase in arterial oxygenation in these patients is likely to cause a concomitant and potentially harmful rise in the arterial CO2 pressure (PaCO2) . The relation between blood oxygen saturation (or content) and partial pressure is not constant, even within an individual. Classically the factors recognised to influence the oxygen dissociation curve (ODC) include the local prevailing CO2 partial pressure (PCO2), pH and temperature. The curve is shifted to the right (i.e. lower saturation for a given PO2) by higher PCO2, greater acidity (lower pH) and higher temperature. The effect of PCO2 (known as the “Bohr effect”) is mediated largely by the accompanying change in acidity; in vitro studies have shown that PCO2 itself also has an independent effect, which becomes most evident under more acidic and severely hypoxic conditions . The factors which shift the ODC to the right (lower pH, higher temperature and PCO2) are directly relevant to the conditions which prevail in metabolising tissues and consequently, as blood flows through the tissues, the ODC shifts to the right. This implies a reduction in the affinity of the blood for oxygen (for a given PO2, venous blood contains less oxygen than arterial blood), which is advantageous as it facilitates the unloading of oxygen from haemoglobin in the tissues. The converse occurs during passage through the pulmonary capillaries, with the greater affinity accompanying a shift of the ODC to the left aiding the uptake of oxygen. A further compensatory mechanism which aids oxygen delivery by altering the position of the ODC is the concentration in the red cells of 2,3-biphosphoglycerate (also known as diphosphoglycerate (DPG)), an intermediate metabolite in the glycolytic pathway which binds to deoxyhaemoglobin. Higher concentrations of 2,3-DPG, seen, for example, with chronic hypoxia, shift the curve to the right, again facilitating the extraction of oxygen by metabolising tissues. As prevsiouly discussed, the blood oxygen content is directly proportional to the haemoglobin concentration and, consequently, anaemia (and polycythaemia) has largely predictable effects on the ODC. In simple terms, a reduction of haemoglobin concentration to half of the normal value is accompanied by a similar reduction in arterial oxygen content with no (or very little) change in % saturation or PaO2 (figure 2). Despite reduced oxygen carriage by the blood, tissue oxygen consumption is likely to show little change and is maintained by several compensatory factors, including higher cardiac output and greater extraction of oxygen by the tissues. Consequently, the blood “reserve” of oxygen is diminished and the venous oxygen content, saturation and partial pressure are all less than normal. ODCs in a theoretical subject with anaemia and haemoglobin (Hb) concentration of 7.5 g ⋅ dL−1 compared to normal haemoglobin concentration of 15 g ⋅ dL−1. When oxygen content is plotted against PO2 the curve in anaemia is scaled down by 50%, reflecting the halving of oxygen carrying capacity (dissolved oxygen is ignored); when SaO2 is plotted the anaemic and normal curves are superimposed. A large number of genetically determined abnormal haemoglobins have been described, one of the more familiar being HbS which is found in patients with sickle cell disease. In individuals with a haemoglobinopathy, the abnormal molecules comprise a variable proportion of the total haemoglobin and consequently, the effects are similarly variable. Compared to the normal adult HbA, the abnormal haemoglobin molecules are associated with shifts of the ODC which can be either to the right (low oxygen affinity haemoglobins) or to the left (high oxygen affinity haemoglobins). The position of the ODC can be quantified by the P50, which is measured in vitro as the partial pressure of oxygen at a saturation of 50%. The P50 of normal adult blood is approximately 26 mmHg; low affinity haemoglobins are characterised by higher P50 and high-affinity haemoglobins by a lower than normal P50. Such abnormal haemoglobins can have major consequences for tissue delivery of oxygen but their effects are mitigated by various compensatory mechanisms, one of which is the haemoglobin concentration. High-­affinity molecules, by definition, release oxygen less readily than normal and, because tissue hypoxia is a stimulus to haemoglobin production, affected individuals often have polycythaemia. By contrast those with low affinity haemoglobins are usually anaemic. CO competes reversibly with oxygen for binding sites on the haemoglobin molecule but haemoglobin has a much greater affinity (about 200-times) for the former and a large proportion of the binding sites will be occupied by CO, even at low partial pressure of CO. In addition, the presence of carboxyhaemoglobin results in a shift of the ODC to the left, further compromising tissue oxygen delivery. The usual indices of oxygenation are potentially misleading in CO poisoning; in particular, PaO2 is likely to remain normal and saturation may also appear normal when measured as SpO2 since most pulse oximeters (which utilise only two wavelengths of light) measure carboxyhaemoglobin together with oxyhaemoglobin. ­Distinction is ­possible using a specific CO pulse oximeter, which utilises several wavelengths, but such devices are not currently widely available . In suspected CO poisoning, carboxyhaemoglobin should be measured on a blood sample by multiwavelength spectrophotometry, as incorporated in modern blood gas analysers. The binding of CO to haemoglobin is reversible and can be reduced by increasing the inspired (and consequently the arterial) PO2. Patients with CO poisoning are therefore treated with the highest possible inspired oxygen concentration; sometimes hyperbaric oxygen is employed with the rationale that the higher the PaO2, the more CO molecules will be displaced from haemo­globin and that the increase in the very small amount of dissolved oxygen at very high PaO2, may help to sustain life . The reversible binding of oxygen by haemoglobin and the sigmoid shape of the ODC have been recognised for more than 100 years following the pioneering work of Bohr, Roberts, Barcroft and others . Over the years several mathematical models have been used to describe the ODC with varying success [8, 9]. We are unaware of any validation of this simplified Severinghaus equation using large numbers of clinical blood samples. We therefore studied 3524 routinely obtained and anonymised blood gas results (2255 specimens with normal pH (7.35–7.45), 558 acidaemic specimens with pH <7.35 and 711 alkalaemic specimens with pH >7.45). For each of the specimens with normal pH, the oxygen saturation (SO2) measured by the co-oximeter in the blood gas analyser was compared with the value calculated from the PO2 using the simplified Severinghaus equation. The mean±sd SO2 calculated using the Severinghaus equation was 0.16±1.12% less than that measured directly, with slight overestimation of SO2 in samples with PO2 <7.5 kPa (56 mmHg) and slight underestimation with PO2 between 7.5 and 14.5 kPa (109 mmHg). In order to compare the measured and calculated curves, PO2 values were grouped in terms of the nearest integer value between 4 and 17 kPa and the corresponding SO2 value was averaged (measured curve) or derived using the Severinghaus equation (calculated curve). Overall, we found that the simplified equation of Severinghaus estimated, with remarkable accuracy, the SO2 in blood from patients with normal pH and SO2 >70% (figure 3). 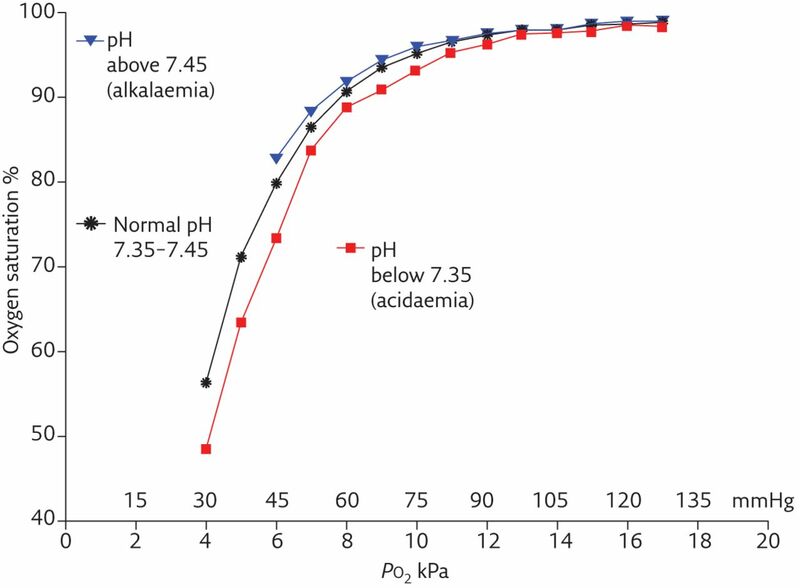 The results of the samples with abnormal pH confirmed the Bohr effect of rightward shift of the ODC with ­acidaemia and leftward shift with alkalaemia (figure 4). However, among the specimens with normal pH, variation in PCO2 had no apparent effect on the ODC. Comparison of average oxygen dissociation curves based on measured arterial blood saturation and arterial PO2 in patients with normal pH (7.35–7.45) with values calculated using the simplified Severinghaus equation. Mean relationships between arterial PO2 and measured oxygen saturation in blood specimens with different pH ranges. To our knowledge this is the first large-scale validation of this equation using clinical specimens. The results fitted by the equation also clearly demonstrate the effects of varying pH in vivo. While our results do not exclude an additional effect of PCO2, independent of the accompanying change in pH, we did not find such an effect within the normal pH range. What is the difference between SaO2 and SpO2? Directly measured arterial oxygen saturation (SaO2) requires invasive blood sampling by ­arterial ­puncture or insertion of an indwelling arterial cannula. The SaO2 of the sample is measured together with PO2, PCO2 and pH in a hospital laboratory or by bedside blood gas analysis equipment. SaO2 is measured spectrophotometrically by a multiwavelength co-oximeter, based on the absorption of light at several different wavelengths. Non-invasive pulse oximetry has been in widespread use since the 1970s and offers the clear advantages of no discomfort, immediate results and availability of continuous monitoring. A pulse oximeter measures SpO2 based on the absorption of light by pulsating arterial blood at two specific wavelengths that correspond to the absorption peaks of oxygenated and deoxygenated haemoglobin. Although less accurate than SaO2, the typical difference of <2% is usually of no clinical significance. The probe is placed on the patient’s finger, earlobe or toe, with the finger usually the most convenient. An important caveat is that pulse oximeter measurements can be less reliable in instances where the patient has poor peripheral perfusion either acutely or chronically; however, most devices are equipped with a detector for pulse signal strength to guide reliability of measurements. Additional factors which can affect reliability of oximetry include skin pigmentation, nail varnish and the presence of methaemoglobin or carboxyhaemoglobin. Pulse oximeters have been found to be generally reliable when oxygen saturation is >88% but less so when the saturation is lower. Since most patients are likely to be treated with oxygen to a target saturation of >90%, however, inaccuracy at lower levels is unlikely to compromise patient safety . When is pulse oximetry sufficient and when is blood gas analysis required? Self-evidently, a pulse oximeter gives no information about arterial PCO2 or pH, so that in a patient with exacerbation of chronic obstructive pulmonary disease (COPD) or suspected diabetic keto­acidosis, where the clinician also needs information about PaCO2 and/or acid–base status, arterial blood gas sampling is always necessary. Nevertheless, in exacerbations of COPD intermittent blood gas sampling is often usefully supplemented by more frequent monitoring by pulse oximetry to give early warning of deterioration and to indicate the need for further arterial sampling. Also, for patients who are not at risk of hypercapnic ­respiratory failure or metabolic acidosis (for example a patient with acute asthma with oxygen saturation >92%), it may not be necessary to undertake blood gas measurements because monitoring of oxygen saturation may suffice . Arterial blood gas analysis is widely accepted as the gold standard for assessing oxygenation and ventilatory status however, recent evidence suggests that arterialised capillary blood gases sampled at the earlobe give closely similar results for pH and PCO2 to arterial samples. However, for PO2, capillary samples underestimate the arterial value . These findings suggest that for many patients, capillary blood measurements of pH and PCO2, together with frequent monitoring of oxygen saturation by pulse oximetry, could be used to guide management. In seriously ill patients, it is advisable that at least a baseline arterial blood gas analysis is performed, with capillary blood gases supplemented by pulse oximetry having a potential role in monitoring progress once the patient is stabilising. Earlobe blood sampling is accompanied by significantly less pain than arterial sampling, although pain from the latter can be reduced by the use of local anaesthetic before sampling . Venous blood from peripheral veins or central venous catheters or mixed venous samples (from a pulmonary artery catheter) can be analysed in a blood gas analyser but, clearly, the results will be different from those obtained from an arterial or capillary sample. Central or mixed venous oxygen saturation is commonly monitored in critical care units as part of goal-directed therapy to optimise oxygen delivery in patients with critical illness or sepsis. This specialist and complex topic is outside the scope of this brief review. With the knowledge that venous pH is slightly lower and PCO2 slightly higher than arterial values it is possible to make an approximate estimate of the arterial pH and PaCO2. The pH of peripheral venous blood is typically about 0.02–0.04 pH units lower than the arterial pH, and the venous PCO2 about 0.4–1.1 kPa (3–8 mmHg) higher than arterial. However, the differences are greater in hypotensive patients and samples from different peripheral veins will vary depending on local metabolism. Peripheral venous PO2, however, does not allow valid estimation of the arterial value. Clearly, arterial samples should be obtained if accurate measurements are required but peripheral venous samples may be used for monitoring relatively stable patients between intermittent arterial samples. The main value of peripheral venous blood gas analysis is to exclude the need for arterial sampling if the pH and PCO2 levels are satisfactory in a patient who is known to have normal oxygen saturation (assessed by pulse oximetry). In one study a venous PCO2 <6 kPa (45 mmHg) had 100% sensitivity for eliminating the risk of hypercapnia (arterial PCO2 >6 kPa or 45 mmHg), although the specificity was low at 57% . These results therefore suggest that it may not be necessary to proceed to arterial sampling if a patient with normal oxygen saturation by pulse oximetry has a venous pH >7.35 and venous PCO2 <6.0 kPa because hypoxaemia, hypercapnia and acidaemia can be excluded with reasonable confidence. However, other data have shown that venous PCO2 is a less predictable guide to PaCO2 in patients whose condition is less stable and the clinical role of peripheral venous blood gases is not fully established . In which instance might you find a normal SpO2 e.g. 98% but reduced oxygen delivery? Which relationship does the ODC represent? In which of the following clinical situations might you consider not needing to perform arterial blood gas analysis?
. Review of Medical Physiology. 21st Edn. USA, McGraw Hill, 2003; pp. 669–672. BTS guideline for emergency oxygen use in adult patients. Thorax 2008; 63: Suppl 6, vi1–vi68.
. The management of acute respiratory failure in chronic bronchitis and emphysema. Am Rev Respir Dis 1967; 96: 26–639. pH and molecular CO2 components of the Bohr effect in human blood. Scand J Clin Lab Invest 1966; 18: 96–102.
. The measurement of carboxyhaemoglobin and methaemoglobin using a non-invasive pulse CO-oximeter. Respir Physiol Neurobiol 2012; 182: 88–92. Practice recommendations in the diagnosis, management and prevention of carbon monoxide poisoning. Am J Respir Crit Care Med 2012; 186: 1095–1101.
. History and theory of the oxyhaemoglobin dissociation curve. Crit Care Med 1979; 7: 360–367.
. Simple, accurate equations for human blood O2 dissociation computations. J Appl Physiol 1979; 46: 599–602. Oxygen saturation calculation procedures: a critical analysis of six equations for the determination of oxygen saturation. Intensive Care Med 1989; 15: 385–389.
. Blood Gas Calculator. J Appl Physiol 1966; 21: 1108–1116. Arterial versus capillary blood gases: a meta- analysis. Respir Physiol Neurobiol 2007; 155: 268–279. Pain during arterial puncture. Chest 1996; 110: 1443–1445.
. Venous pCO(2) and pH can be used to screen for significant hypercarbia in emergency patients with acute respiratory disease. J Emerg Med 2002; 22: 15–19. Clinical utility of sequential venous blood gas measurement in the assessment of ventilatory status during physiological stress. Intern Med J 2013; 43: 1075–1080.